Shopping for a new Honda Accord Sedan? Stick with the base engine and automatic, perhaps in EX-L trim, for best value, fuel economy, comfort, and class. It’s not overpriced at just over $30,000. The 2018 Honda Accord mid-size sedan isn't just a redo, it's a rethink. After milquetoast versions of the mid-sizer in previous years, a new four-door arrived this year. In many trims, the 2018 Honda Accord could have just as easily have come from a luxury automaker. 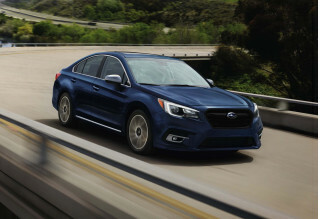 The new sedan boasts a bevy of upscale features including a 10-speed automatic, soft leathers, wood dash accents, interior noise cancellation, LED headlights, advanced safety features, and an elegant 8.0-inch touchscreen. Yeah, we know. But even in base trim, the Honda Accord maintains its remarkable value. 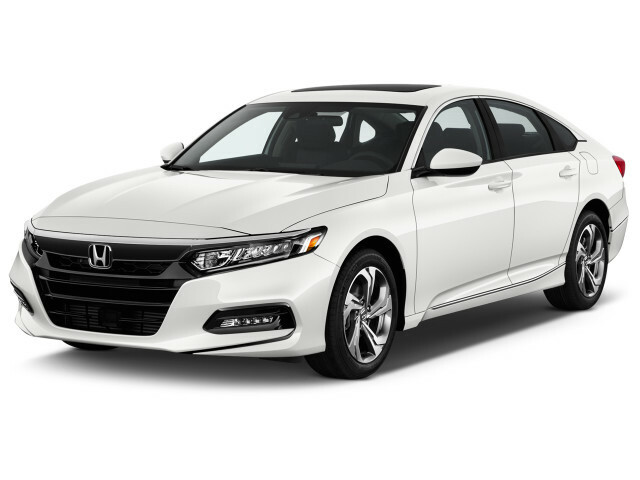 Starting at $24,445 for an Accord LX, the sedan is equipped with a fuel-efficient 1.5-liter turbo-4, a continuously variable automatic transmission, a quiet interior, generous rear leg room, and a composed ride. Stepping up to Accord EX or Accord EX-L trim adds relative comfort including upgraded upholstery, bigger wheels, and better audio. Accord Touring sedans have no business being called commuter sedans—they’re low-level luxury cars. We only question the Accord’s dominance in a few respects. While Honda has swapped out a V-6 for a very powerful 2.0-liter that makes 252 horsepower, a 6-speed manual is available across the board—and without the perk of being cheaper than an automatic. It’s a no-cost option this time around. We also wonder aloud why Sport versions, sandwiched between LX and EX, boast bigger wheels, but skip the adaptive suspension setup on Touring models that makes for a crisper ride. Quibbles aside, the Accord will be joined early next year by an Accord Hybrid that should be the efficiency champ. It pairs a 2.0-liter inline-4 with an electric motor and more compact batteries shifted underneath the rear seat. All in, the 2018 Accord is a sharp sedan that’s far better than it needed to be. In other words: worth the wait. On-trend angles and traditional proportions merge to make the 2018 Honda Accord one of the best-looking mainstream sedans that we’ve seen in a while. The 2018 Honda Accord sheds its frumpy past in search of right angles and hard edges for the future. It’s a look that other Asian-based automakers have attempted, but few have succeeded in so far. From the nose, the Accord appears to have borrowed Toyota and Nissan’s protractor—and Acura’s playbook. While we see an Acura-like beak in the Accord’s nose, it’s actually better than that. The lines are drawn from the sides of the headlights into the Accord’s upper lip in a way that reads smaller than it is in person. A chrome grille adds some unnecessary flair, but the whole design isn’t too overwrought. Where the Honda Accord rights others’ wrongs is in its proportions. The front roof pillars have been pushed back by 4 inches, and the result is a cabin set further back from the front axle that belies its front-drive configuration. The hood is lower than in previous years, a boon to outward vision from inside and curb appeal from the outside. In profile, the Accord tempts with a sportback shape (that we wish they’d finish) with a stretched rear roofline that arches back toward the end without much of a trunk lid. 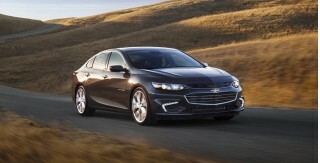 It borrows from other sedans that have found sportback models, and looks similarly handsome. A borrowed tuxedo is still a tuxedo, right? Around back, the Accord finishes up nicely with plenty of rear glass and a decklid that’s seemingly invisible from the profile, but there’s no buttresses hiding it. Lighter colors, including white, are a risky pick—the Honda badge appears to float more than in other colors. The boomerang taillights do no wrong here; they’re sharp, but not aggressive. Inside, the Accord is dramatically improved, thanks partly to thinner roof pillars that present the windshield in widescreen format. The lower nose and windshield rake soak in natural light, and a low horizontal dash doesn’t get in the way either. The centerpiece in many models will be an 8.0-inch touchscreen that floats from the dash without looking tacked on. The sides of the doors are drawn along the dash and into the center stack, which gracefully dips into the console and out of the way. Top trims of the Accord boast wood accents, a dash we’d welcome in any luxury car. In lower trims, with darker colors and darker upholstery, the effect is muted although still present. We’d advise saving pennies for better materials. It’s worth it. The 2018 Honda Accord handles its available power with grace and ease. When did “fine” become a pejorative? Performance is relative in the 2018 Honda Accord. 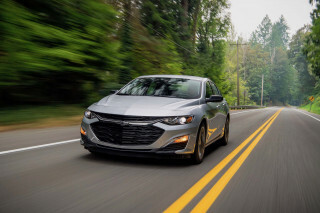 While it boasts an engine borrowed from Honda’s hottest hatchback in years and it sports manual transmissions across the lineup, speed was never the Honda Accord’s mission. 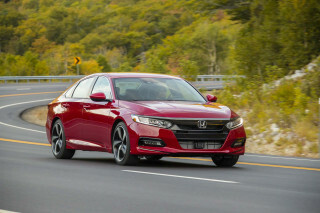 Four out of five Honda Accords on the road will feature a 1.5-liter turbocharged inline-4 that makes 192 horsepower and 192 pound-feet of torque. Mated to either a 6-speed manual or continuously variable automatic transmission (CVT), this Accord doesn’t hide its pedestrian intentions. The engine is tuned toward low-end grunt, an unintended consequence of swapping in fuel-efficient turbochargers. Off-the-line acceleration may fool drivers into believing that the base turbo-4 has more gusto than it does—that’s OK. Deep stabs at the throttle will reveal that the turbo-4 runs out of ideas somewhat quickly, and adding the manual transmission only makes it worse. Despite our affirmation that CVTs are from the underworld, we’ve found religion: it’s the pick in the Accord because it won’t highlight this engine’s limited capabilities. Honda dropped the V-6 this year in favor of another turbo-4, this time borrowed from the hot Civic Type R hatchback. The Accord’s version has been detuned to 252 hp and 273 lb-ft, with a revised engine map that won’t kink necks or fluster backs. The bigger engine is mated to either a 10-speed automatic borrowed from the Odyssey or a 6-speed manual—again, plucked from the Type R. We say skip the manual here too: the clutch pedal is impossibly light, with a high takeup, and a unique linkage for the Accord results in long throws for the shifter. The 10-speed is more than adequate, and when equipped with paddle shifters, it’s the Accord’s best life. We’d ask for a less complicated gear selector (the shifter has been replaced with a series of Bop-it buttons: pull for reverse, push for drive or park) but these are small annoyances. Honda makes the decision easier for us this year too—opting for the manual doesn’t save any money this time around. A revised electric power steering system that uses adjustable ratios is a first for the Honda Accord. It’s a quicker rack at the edges, slower in the middle for longer slogs on the interstate when the steering wheel should feel optional. It’s well-weighted and much better than the outgoing version, which felt soggy to us in comparison. A revised front suspension system that uses a different control arm and fluid filled bushings soaks up road imperfections. Most Accords use a traditional front strut, rear multi-link suspension setup, but higher trims feature Honda’s adaptive suspension system that can toggle between sport and normal modes for stiffer damper settings, also found in the Civic Si and Type R compacts. The adaptive dampers help the Accord feel composed and confident when the road turns into a workout, relaxed and sedate everywhere else. Cars equipped with the base suspension are more communicative than you might expect, but hardly profane. Sport trims get their own 19-inch wheel-tire combinations and a forewarning: those versions prioritize looks over comfort. The Honda Accord Hybrid returns this year for its third generation. The first wave of Accord Hybrids will appear early next year, but will largely sport the same powertrain from last year. A 2.0-liter Atkinson-cycle inline-4 that makes 143 hp is planted under the hood, while the batteries and power control unit have shifted from the trunk to underneath the rear seats. The series or parallel hybrid powerplant worked together seamlessly in our drives of early prototypes, although we could hear some gremlins that Honda says they’re working out. The net power output from engine and electric motors is 212 hp, which is relatively unspoiled by the weight savings from smaller batteries. The Accord Hybrid and 2.0-liter Accord weigh roughly the same. Effective packaging makes the 2018 Honda Accord a supremely comfortable mid-size sedan. The 2018 Honda Accord’s best quality may be that it’s far better than it needs to be. Four passengers will ride in superlative comfort—five in a pinch—in a quiet, competent sedan that’s useful far beyond its intended mission. The Honda Accord makes best use of its shape by maximizing interior room. 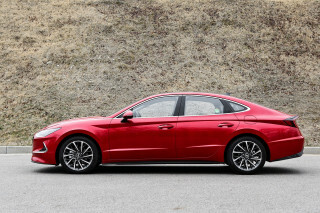 Although the sedan has a longer wheelbase that’s also wider and lower to the ground, the overall length bumper-to-bumper is down 2 inches from last year’s model. By strict EPA measurements, sedans without a moonroof are technically full-size cars inside. With a moonroof, it dangerously tempts our rulers. The extra length between the wheels goes to rear seat passengers who get more than 40 inches of leg room in the back. Two 6-footers can sit behind two other 6-footers. The only thing keeping the Accord from hosting the Cavaliers’ starting five? Slightly pinched shoulder space is all we can think of. Two will fit in the back with ease, made better by wide opening rear doors, despite rear seats that have been lowered by nearly 1 inch. Honda says that rear-facing child seats should fit in the back without any sacrifice to front-seat space. Up front, a driver’s seat lowered by 1 inch makes for ample head room and a better driving position that places its occupant better into the center of the car’s mass. The seats aren’t especially hard to get into; only when the seat is in its lowest position did we think less-than-flexible drivers may have difficulty getting into and out of the Accord. Deeper rear outboard seats may make riding hump a little more uncomfortable than prior years, may we suggest keeping a smaller, rear sibling on you at all times? Active noise cancellation is standard on all trims and includes a third microphone placed in the rear of the car to void noises coming from the road or engine. EX and higher models are fitted with wheel resonators that quash noise coming from tires. Base Accords feature a handsome cloth that doesn’t feel especially durable, while top trims get soft leather, or cloth inserts that feel more substantial. The Accord’s trunk swallows 16.7 cubic feet of cargo in any configuration—the Hybrid’s batteries have been moved from the trunk to underneath the rear seats this time around. Split taillights make the trunk opening wider than before, 60/40-split folding rear seats tumble forward for more capacity. It all adds up to an Accord that’s more spacious than ever, quieter than before, and comfortable. Numbers tell the story, but there’s more. Whether you need it or not. A wide array of standard safety gear and good crash test scores are assets for the 2018 Honda Accord. The 2018 Honda Accord nearly aced our safety score with perfect crash-test scores from federal and independent testers. The only blemish? The Accord's headlights. Honda’s safety ace this year is standard advanced safety features on every Accord—even base trims. The system, which the automaker calls “HondaSensing,” includes forward-collision warnings with automatic emergency braking, active lane control, and adaptive cruise control. It’s on every model, built into the entry price, and it’s a great addition. We hope more automakers follow Honda’s lead. The IIHS says that the Accord earns a Top Safety Pick award. It's held back from the top score thanks to its headlights, which rate "Acceptable" on most trim levels but just "Marginal" on the range-topping Accord Touring. Better headlights would earn it a Top Safety Pick+ award. Good features abound, but the 2018 Honda Accord is best at extremes: base or fully loaded. The 2018 Honda Accord lives inside the margins. Although its features are well-considered and easy to use, most of them will be familiar for many buyers. The Honda Accord is offered in LX, Sport, EX, EX-L, and Touring trims. 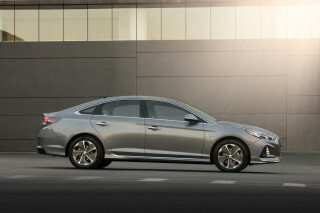 Accords equipped with the larger 2.0-liter turbo-4 are available in Sport, EX-L, and Touring, while Accord Hybrids are offered in base, EX, EX-L, and Touring trims. 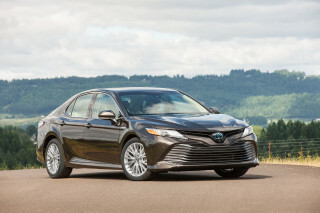 LX trims start at $24,445, while top end models can approach $40,000. An 8.0-inch touchscreen with updated controls is new this year and replaces the outgoing dual-screen system that was clunky and outdated. The new screen is sharp, placed elegantly on the dash, and borrowed from the Odyssey where it worked well. That 8.0-inch touchscreen is standard in all but the base model, which gets a 7.0-inch display instead. Only the larger touchscreen is compatible with Android Auto and Apple CarPlay. Stepping up from base to the Sport model adds 19-inch wheels and chrome exhaust tips, a decklid spoiler, leather-wrapped steering wheel, power-adjustable driver’s seat, a larger 8.0-inch touchscreen, synthetic leather inserts in the cloth seats, and fog lights. EXs are trimmed with more niceties and lose the bigger wheels—a bonus for better fuel economy. Heated seats, satellite radio, upgraded cloth upholstery, moonroof, blind-spot monitors, and one more USB port headline the changes. EX trims get a chrome grille that starts to punch higher than the Accord’s weight class into luxury territory. The jump to EX-L models is a hefty $2,500 proposition, but includes niceties such as power-adjustable front seats, leather accents, a 10-speaker premium stereo, and optional navigation. 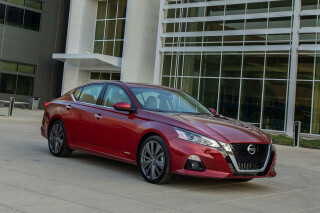 This year’s top Touring trim boasts heated and cooled front seats, heated rear seats, a head-up display, navigation, wireless cellphone charging and one-touch Bluetooth connectivity (for compatible smartphones) and paddle shifters. Accord Touring models rival luxury cars in every aspect but the badge up front, while base EX models represent good value in the class. No Accord looks cheap, but some interior trim packages can make the confines unnecessarily dark. Opting for the larger 2.0-liter turbo-4 over the base 1.5-liter turbo-4 adds more than $4,500 to the bottom line, and opting for a manual transmission won’t save any money either—it’s a no-cost option. The newest Honda infotainment system is a continuation of the about-face the company started last year. The 8.0-inch touchscreen found on most models is slick, with bright icons that clearly display easily readable functions. Swiping and scrolling is a breeze, and while slightly confusing at first, the system becomes easily navigable without much attention. A hard knob for volume is joined this year by another knob for tuning and scrolling. A series of hard buttons for common tasks such as radio and track controls flanks the touchscreen on both sides, and it’s no small matter. Just ask Honda when they took away all of the above a few years ago to many owners’ ire. All 8.0-inch touchscreens are equipped with Android Auto and Apple CarPlay compatibility, which could save some shoppers money when considering whether to opt for navigation on EX-L trims. We say skip the Honda system unless you’re considering the other amenities found on a Touring trim. Honda’s navigation is fairly unprotected—it’s bad for baseball, but good for value-minded shoppers. The 2018 Honda Accord is very fuel-efficient for its size. The 2018 Honda Accord strikes out on a different path for mid-size sedans this year. The Accord eschews the typical formula of 4- and 6-cylinder engine choices for a trio of inline-4s. A larger, 2.0-liter turbo-4 is available on top-trim models isn't as efficient. When paired to a 10-speed automatic, the EPA rates it at 23/34/27 mpg. In Sport or Touring trims it's rated at 22/32/26 mpg. Both 1.5-liter and 2.0-liter turbo-4s can be paired with 6-speed manual transmissions, but they’re less efficient than the automatics. The 1.5-liter version manages 26/35/30 mpg, and the 2.0-liter version is rated at 22/32/26. Sport-trimmed versions are rated slightly lower due to a different wheel-tire combination that prefers style over efficiency. Sometime this year, the Honda Accord Hybrid will join the lineup. It pairs a 2.0-liter Atkinson-cycle inline-4 with a two-motor hybrid system and batteries. It's rated at 47/47/47 mpg by the EPA. One of the best car I have ever driven , Honda will shock the world once people will start to know this incredible car. Honda was determined to show their muscle with this car in 2018. A big surprise to the world by Honda Accord 2018. The car is incredible inside and out . Most people don't know the car yet. Soon the world will be in chock once people will star talking about this car.